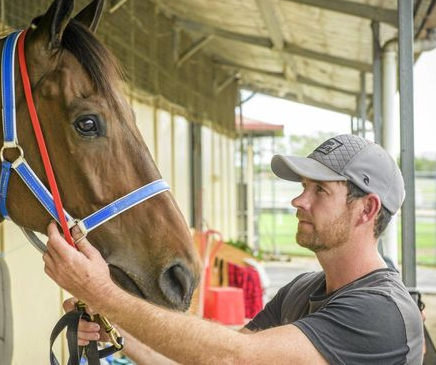 Grafton trainer Shane Everson looked all set to farewell Ilia from his stable during the winter before the mare well and truly turned her form around in mid-July. Ilia ($5 on TAB fixed odds) has now won four of her past five starts and chases her third straight win at Grafton when she lines up in the Belflyer For The Kosciuszko Benchmark 58 Handicap (1106m), the final race at Thursday's 10-race meeting. The mare is owned by Everson's grandfather, Tamworth trainer Peter Cleal, and looked headed back to the New England region after some indifferent performances earlier this year. "She wasn't going that well and Pop (Cleal) told me I'd better send her back to him," said Everson. "I said I'd keep her a bit longer but if she didn't find some winning form by July I would send her back to him. "Actually, a few of her runs were a lot better than they looked, and then everything just fell into place for her and she started winning again. "She's a funny mare, she a real 'fatty' as she puts on so much weight between runs." Ilia had gone win-less since December 2016 before she bounced back to win a F&M Class 2 Hcp (1100m) at Grafton on July 15. She won again at Casino two starts later on August 11, then put together back-to-back wins at Grafton - landing a Benchmark 58 Hcp (1200m) on August 20 and a Benchmark 50 Hcp (1106m) on September 1. "She loves her home track at Grafton," said Everson. "Even when she wasn't winning she still always seemed to run well here." Five of Ilia's six career wins have been at Grafton and she has been placed another six times from a total of 17 appearances at the track. "Thursday's race is certainly harder than her recent races, so she has to step up again," said Everson. "And there looks to be a lot of pace in the race. She's a bit one-dimensional in that you really have to ride her forward. She can also sometimes be a bit slow to jump, but if she jumps okay she should be able to put herself into the race from her good draw." Ilia has drawn ideally in gate five in Thursday's 14-horse field and will be partnered by her regular rider, Everson's 2kg-claiming apprentice Olivia Pickering. Pickering will also ride Everson's two other runners at Thursday's meeting - Light Motion ($10) in the Benchmark 58 (2215m) and Sister Bertrille ($34) in the Class 1 Hcp (1206m). Leading Murwillumbah trainer Matt Dunn will have several key runners at Thursday's meeting, including Dram Of Delago, who looks set to break through when she resumes in the F&M Maiden Hcp (1106m). Dram Of Delago is resuming since May when she ran well in several strong two-year-old races in Brisbane after having the misfortune to bump into crack South Australian filly Sunlight at the Gold Coast earlier in the season. Dram Of Delago was making her debut when she chased home Sunlight at the Gold Coast on December 23 before the Tony McEvoy-trained filly went on to win the Magic Millions, the Silver Slipper, the Magic Knight and a third in the Golden Slipper during her stellar two-year-old season. Dram Of Delago tuned up for her return with an easy Deagon barrier trial win on August 30. Dunn's other leading Grafton contenders are Pay Day Grey (Maiden Plate, 1710m), Mother To Race Her (Class 2, 1710m, $3.70 favourite), and Arrestar ($12) and Vivid Pink (Class 3, 1410m, $4.40).